Of all our cats’ curious behaviors, their fondness for cardboard boxes is one of their most peculiar traits. If you’ve ever left an empty box out after receiving a package in the mail, chances are it didn’t take long for your cat to make themselves at home in it. Even big cats like tigers and lions demonstrate this predilection for hanging out in cardboard boxes. So why is your cat always trying to squeeze herself into comically small boxes? Recently, animal behaviorists have proposed a few possible answers to this question. One theory suggests that cardboard’s insulating properties can help cats retain body heat, keeping them in their comfortable “thermoneutral zone” where they don’t have to expend any energy to cool off or stay warm. Another theory attributes the behavior to cats’ predatory hunting instincts. 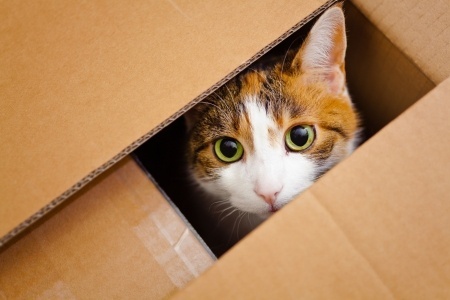 Cats may feel comfortable in boxes because it allows them to conceal themselves and stalk their prey (or their toys, as the case may be). A third, similar theory states that cats like to hang out in boxes due to their solitary nature. A dark, cozy box can serve as an ideal place for a cat to retreat from the world and enjoy some alone time. In fact, cats probably like their boxes for a combination of all of these reasons. Cardboard boxes offer cats a unique vantage point that allows them to get comfortable, stay warm and keep an eye out for unsuspecting prey. It just goes to show that one man’s trash is another cat’s treasure.